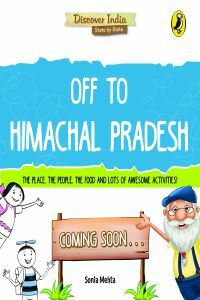 Product description: Discover India: Off to Himachal Pradesh is written by sonia mehta and published by Puffin. Buy Discover India: Off to Himachal Pradesh by sonia mehta from markmybook.com. An online bokstore for all kind of fiction, non fiction books and novels of English, Hindi & other Indian Languages. Here`s your opportunity to explore India like never before. The Discover India series will take you on a grand tour of every single one of our country`s states. Join the adorable Pushka and Mishki and the wise and witty Daadu Dolma as they traverse the length and breadth of India. Through song and dance, clothing and architecture, Daadu and the gang will lead you to the beating heart of every state!